A review of The Civilizing Project in Medieval Korea: Neo-Classicism, Nativism, and Figurations of Power by Javier Cha. This ambitious dissertation focuses on what the author calls Neoclassicism in Korea. Neoclassicism is the name that the dissertation prefers to use to refer to what others call Ancient Style learning (guwen 古文) in China and Korea. In order to avoid confusion with studies that advocate a view known as the “internal development theory,” the dissertation also carefully distinguishes between Neoclassicism and Cheng-Zhu learning, also more commonly known as Neo-Confucianism. There is, indeed, still a strong tendency within Korean scholarship to attribute the Koryŏ-Chosŏn transition to the inevitable evolution from an older aristocratic order to a rational bureaucracy based on Confucian and, later, Neo-Confucian ideology. The author rejects this internal development theory (and its teleological implications about the inevitability of an indigenous modernization) and focuses instead on the complex process through which the location of Confucian tradition took place in Koryŏ, “an environment that was marked by ideological pluralism” (p. 1). For the author, we cannot speak of the localization of the Confucian tradition until the fourteenth century when a yangban coalition that formed under Mongol rule used the notion of a native antiquity to establish a centralizing and stable aristocratic order in Korea. As the author emphasizes repeatedly throughout the dissertation, both Neoclassicism and Neo-Confucianism is rooted in a “Confucian nativism” that emerged in China between the years 750 and 1100, which the author calls the Tang/Song transition period. The dissertation limits its investigation of the “adoption” and “maturation” of this form of Confucianism to a period that the author calls the “medieval” period (875-1545). The author points to two major reforms as the catalyst responsible for the adoption and maturation of Neoclassicism in Korea. Both waves of reform cover a broad swath of time. The first wave (1046-1122) corresponds to the reigns of King Munjong (r. 1046-1083), Sukchong (r. 1095-1105), and Yejong (r. 1105-1122) and the second roughly corresponds to the age of military rule (1170-1258). Key elements of the first wave of reform were the efforts to establish a centrally planned economy, a professional military, and state examination system as primary means of recruitment. These efforts to stabilize society and establish a centralized aristocratic order, rather than an impulse to build a “modern” legal-rational order, were reactions, the author claims, to the rise of the Khitan Liao (907-1125) and the emergence of a multi-state order in Northeast Asia. Chapter 1, “Genealogies of the Past,” begins with a general overview of the Confucian tradition’s views about the relation between civilized China (Zhongguo zhi ren 中國之人 or Huaxia 華夏) and barbarian outsiders (yidi 夷狄). The overview, which is titled “environmental determinism,” relies on a few well-known sources—the Liji 禮記, Analects, Mencius, Zuo zhuan 左傳, Chunqiu Guliang zhuan春秋穀梁傳, and Hou Han shu 後漢書—and also cites one recently published Korean study to advance the claim that “the Confucian tradition wished to uphold the division of civilization and barbarism,” which is presumably what the author means by “environmental determinism (p. 49). While giving due note to the difficulty of making a neat conceptual division between civilization and barbarism in reality, the author uses these and other more recent studies such as Marc Abramson’s Ethnic Identity in T’ang China to also claim that the Confucian tradition ritually and intellectually advocated “unilateral acculturation,” which required non-Chinese societies to be incorporated or assimilated into the realm of Chinese civilization. According to the author, this “nativist rhetoric” proved to be a real challenge for the Koreans as they tried to adopt Confucianism. The chapter then turns to what is presumably the earliest phase of the adoption of Confucianism in Korea. In this phase “pluralist Confucians” like Ch’oe Ch’iwŏn 崔致遠 (b. 857) “did not regard the civilizing project as an independent mission in Haedong” (p. 59). That is to say, Ch’oe deemed it necessary to rely on “the West” (i.e., Buddhism from India and Daoism and Confucianism from China) and place Haedong or Korea in an inferior position vis-à-vis “the West.” Ch’oe therefore argued against “environmental” or “geomantic” determinism (p. 69). The answer, the author claims, is Koryŏ’s adoption of Neo-Classicism (not to be confused with what the author calls Confucianism), which entailed the extension of Korea’s history beyond the Three Han to “an ancient utopia on Korean soil” (p. 71). As the author claims, “this elaborate making of antiquity aimed to demonstrate that the Confucian utopia was endemic to the Koreans as well” (p. 71). During the so-called First Wave, Neo-Classicists, for instance, tried to “rediscover” Haedong’s own native antiquity in the story of Kija. The author, however, adds the caveat that the aim of the First Wave reformers was “to build a strong monarchy, [and] not necessarily to turn Koryŏ into an exclusively Confucian state” (p. 75). Far more important in achieving this aim of building a strong monarchy during this period was what the author calls “Samhan unification pluralism,” a stance that head-rank Confucians from Silla like Ch’oe Ch’iwŏn maintained. Another attempt to rediscover an ancient utopia in Korea took place during the so-called Second Wave. As evidence, the author cites the poems of two representative Neo-Classicists of the Second Wave where “the Neo-Classicist discourse of civilization and barbarism is turned on its head” (p. 86). Both poems claimed that Koryŏ “surpassed her continental competitors in cultural achievements” and had become the new seat of civilization (p. 87). And, from this, the author contends, emerged a new collective identity of Korea as “a miniature China” (so Chunghwa 小中華). The chapter concludes with a short reflection on the mythical progenitor of Haedong, Tan’gun. Two well-known sources are cited in the chapter’s discussion of Tan’gun: Iryŏn’s 一然 (1206-1289) Memorabilia of the Three Kingdoms (Samguk yusa 三國遺事) and Yi Sŭnghyu’s 李承休 (1224-1300) A Rhymed Chronicle of Emperors and Kings (Chewang un’gi 帝王韻紀). Using these sources, the author argues that the Tan’gun myth is an instance of an effort to establish a native antiquity or “dynastic genealogy” in Korea during and after the Second Wave. It is unclear whether or not the author was trying to argue that Iryŏn and Yi Sŭnghyu were themselves Neo-Classicists. As the author himself rightly admits, “this process [of constructing a dynastic genealogy] initially, and ironically, owed more to Buddhism than Neo-Classicism” (p. 92). It also seems worth noting here the difficulty of neatly distinguishing Buddhism from Neo-Classicism. The difficulty of couching this relationship in exclusivist terms has, in fact, already been demonstrated in Suzuki Tetsuo’s鈴木哲男 Sōdai Zenshū no shakaiteki eikyō 宋代禅宗の社会的影響, and Mark Halperin’s excellent book, Out of the Cloister. Chapter 2, “Institutional Experiments,” provides an in-depth look at the conditions that led to what the author calls “the First Wave,” that is, at “the institutional challenges that prompted the Koryŏ court to turn to the Confucian tradition for solutions” between the years 1046 and 1122 (p. 96). Before turning his own attention to these institutional challenges that surfaced in the eleventh century, the author—presumably for the purposes of drawing a contrast between the relative social stability of Silla and the instability of early Koryŏ—provides a quick overview of the role that the bone-rank system and the policies of the Tang dynasty played in maintaining social stability in Silla. After the collapse of what the author calls “the Tang hegemony in East Asia,” it became necessary to look for alternative strategies of achieving social stability. Among the many strategies that the early Koryŏ court used, the author focuses on just two: the hostage (kiin 其人) system and the local inspector or “inspector-liaison” (sasimgwan 事審官) system. The author shows that the hostage system had been widely used by the states that occupied Northeast Asia to exercise coercion again other states. Domestically, the same system was used for the purpose of coercing local magnates or elites by the new Koryŏ court. The gradual transformation of Koryŏ into a bureaucratic society, however, turned the hostage system into a means for the local elites to “open channels for bureaucratic advancement or to establish important patrimonial ties with the courtiers in the capital” (p. 117). The system thus lost its original meaning and purpose. As the author also points out, the local inspector system, which was originally a reworking of an older feudatory system, similarly failed to serve its original purpose. In response, fueled by an active book trade with the Northern Song, First Wave figures such as Ŭich’ŏn 義天 (1055-1101), Yun Kwan 尹瓘 (d. 1111), his son Yun Ŏni 尹彦頤 (1090-1149), Chŏng Hang 鄭沆 (1080-1136), and Kwŏn Chŏk 權適 (1094-1147) experimented with the activist reform programs of Neo-Classicist thinkers such as Wang Anshi 王安石 (1021-1086) and Fan Zhongyan 范仲淹 (989-1052). The details of the reform programs launched in Koryŏ, as the author rightly notes, are spotty, but a few of the reform programs are identified in the dissertation. Among other things, the state activists hoped to pacify the northern borders, initiate centralized monetary reform, and enforce sartorial regulation. Like their Chinese counterparts, the explicit aim of the First Wave thinkers was to build a centralized bureaucratic order. Chapter 3, “A Patrimonial Aristocracy,” focuses on the important issue of the integration of the center and the periphery in Koryŏ. The author argues that this integration was prompted by the acceptance of the state examination system, which was first implemented in 958. Echoing the views of earlier studies on the formation of the central aristocracy in Koryŏ, the author tries to show that the examination system resulted in the “coalescence of a new aristocratic order centered around yangban courtiers” (p. 144). Several things made the rise of this new aristocratic order possible. First, in Koryŏ, noble titles and estates were in principle not heritable, which precluded the possibility of ascriptive status for the central elites. This resulted in the demise of some notable central descent groups of early Koryŏ (Type C in Table 3.1a and Table 3.3a). Second, the yangban courtiers in the capital tried to maintain their status by relying instead on marriage and patronage. Using data collected and analyzed by Yi Sugŏn (Table 3.3c), John B. Duncan (Table 3.1a), and Kang Ŭn’gyŏng, the author reaches the conclusion that the central aristocratic order began to stabilize and coalesce around new descent groups (Type B in Table 3.1a and Table 3.3c) after the Mongol invasions in the thirteenth century. Prior to this period, local elites continued to use the state examination system to enter the central bureaucracy. This pattern will come to an end, however, as certain yangban lineages learned to use marriage and patronage to monopolize the examinations, reproduce themselves as the central aristocracy, and preserve their privileged status as shown in the following chapter. Chapter 4, “The Dawn of a New Era,” examines a late Koryŏ yangban coalition that formed around the Andong Kwŏn, a descent group that transformed itself from a local elite family to a capital-based aristocracy under Mongol rule (1258-1391). Key members of this coalition include Yi Che-hyŏn李齊賢 (1287-1367), Yi Saek 李穡 (1328-1396), Chŏng Mongju 鄭夢周 (1337-1392), and Yi Sungin 李崇仁 (1347-1392). Chŏng To-jŏn 鄭道傳 (1342-1398), also a member of this coalition, “betrayed his cohorts” and helped the military man Yi Sŏnggye 李成桂 (1335-1408) found the Chosŏn dynasty (p. 207). To make better sense of the Koryŏ-Chosŏn transition the author invokes the parlance of Annales school historiography and refers to Mongol rule as conjoncture, dynastic change as événement, and the long and steady path towards a centralized bureaucratic state as structure. The author explains that his study serves as a corrective to the earlier work of John B. Duncan who downplayed the importance of the événement of dynastic change and the conjoncture of Mongol rule to focus instead on structure to explain the origins of the Chosŏn dynasty. This, the author points out, fails to do justice to the important impact that Mongol rule and its policy of divide-and-rule (“the Mongols partitioned Koryŏ into competing domains, in stages, and placed them under imperial control”) had on the fate of Koryŏ (p. 210). Mongol rule, for instance, led to the decline of the old central lineages of Koryŏ and the rise of northwestern lineages affiliated with the Mongols such as Yi Sŏnggye’s Chŏnju Yi, Hanyang Cho, and Haengju Ki to prominence. The chapter is mainly devoted to a detailed study of the rise of the Andong Kwŏn descent group, which can be traced back to the successful career of Yi Chehyŏn’s teacher and father-in-law Kwŏn Pu 權溥 (1262-1346). This study of the Andong Kwŏn descent group is arguably one of the most valuable parts of the dissertation. The Andong Kwŏn used their relations with the Mongol imperial family to exert much influence at court. They also forged close relations with the most powerful descent groups in the capital and accumulated wealth often through illicit means. But the Andong Kwŏn or, more specifically, Kwŏn Pu’s offspring, affines, and associates formed an influential intellectual coalition whose activities also played a critical role in developing the Neo-Classicist tradition in Koryŏ. As the author shows, Yi Chehyŏn, Yi Saek, and other members of the coalition “localized the rhetoric of cultural imperialism in a context appropriate for Koryŏ” (p. 234). Through the activities of this coalition Neo-Classicism, the author claims, “matured into a full-fledged ideology with a set of theories about nature, society, and time” (p. 201). Inspired by Liu Zongyuan’s 柳宗元 (773-819) essay “On Feudalism” (Fengjian lun 封建論), members of the Andong Kwŏn coalition advanced the notion that a new cosmic cycle had begun under Mongol rule and therefore sought to re-civilize Haedong. But a scion of the Andong Kwŏn, Kwŏn Kŭn, will form a new coalition after the founding of the Chosŏn dynasty and use this “temporal cycle theory” (siullon 時運論) to legitimate the new dynasty. The present dissertation is a welcome addition to the small but growing number of English language scholarship of the Koryŏ period, which are faithfully mentioned and carefully discussed in the dissertation. But rather than repeat or enhance the claims of these earlier studies, the dissertation boldly advances new claims about the adoption of Confucianism in medieval Korea. By looking more closely at the arguments advanced by reformist medieval Korean thinkers and properly situating these arguments in the larger context of Northern Song Neo-Classicism, the dissertation makes a meaningful contribution to the ongoing debate about the so-called aristocratic/bureaucratic balance in premodern Korea. The dissertation will certainly be of interest to scholars interested in the history of Confucianism and, more generally, the intellectual and social history of premodern China and Korea. Harvard University. 2014. 296 pp + vi. Primary Advisor: Sun Joo Kim. 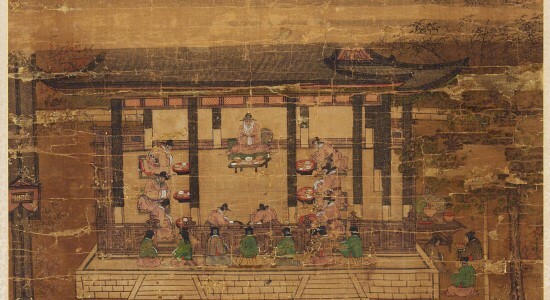 Image: Hojo nanggwan kyehoedo 戶曹郎官契會圖 (circa 1550). It represents the banquet that new yangban members held with the examiner upon attaining their degree. National Museum of Korea.